Local Motors is a Wareham Mass. based startup with a very cool, novel and perhaps paradigm changing model for building cars. The basic idea is crowd sourced car designs based on a spec chassis and then built in a regional micro factory. As I understand it, there would be a design contest within the local motors online community with the designers getting feedback and assistance from the community - the online community also selects the winning design. The designs are based on a spec chassis and Local Motors seems to be partnering with Factory 5 racing, a well established custom car builder. I believe, thought the site is a little vague here, the details of the design such as the doors, tail lights, dash etc. are then designed by the community and I believe they are paid for their work. 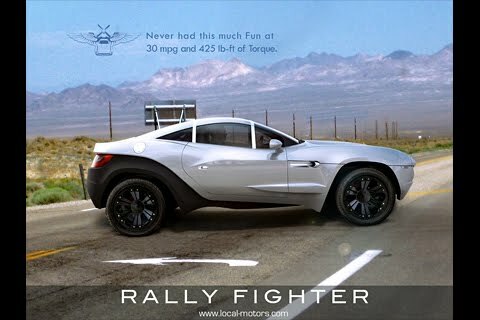 The Rally Fighter above is their first "production" model, based on community design. It's powered by a BMW engine and has an adjustable ride height suspension. They have built a real, in the flesh, prototype that garnered significant buzz and enthusiasm at this years SEMA show. It's kindof fun looking at the details of the various components to figure out where there were sourced. I am 99.97% sure they are using the trunk struts from a VW Phaeton and the tail lights look to be Honda Civic sourced. They are taking deposits on the Rally fighter now and have 40 some odd folks in line to get theirs at around $50K. I have got to go down and check out their operation, they are really small right now, but I bet they could use a top flight PM, and I would love to be involved with an effort like this.